Imants Tillers, Fiction of Place, 2018, synthetic polymer paint, gouache on 132 canvas-boards nos. 106258- 106389, 279.4 x 426.72 cm. (4 September – 6 October) and Sydney Contemporary (13 – 16 September). As one of Australia’s most important living artists, Imants Tillers has been at the forefront of conceptual painting for over four decades. 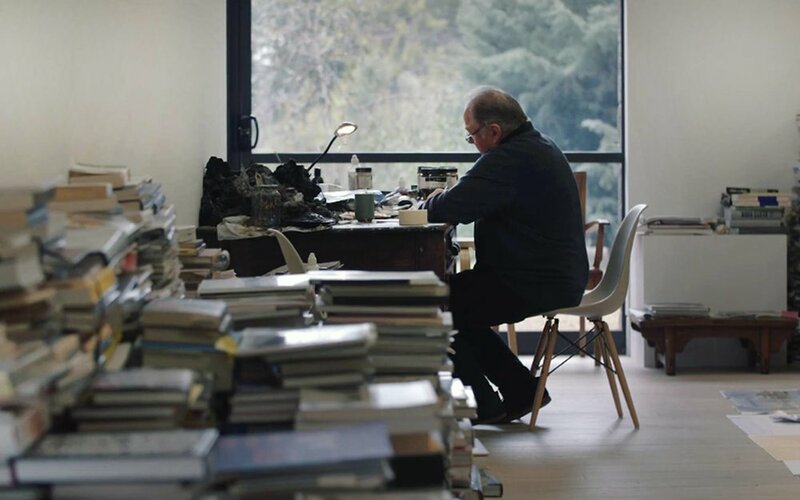 Since his first solo exhibition in 1973, he has forged a reputation as a rigorously intellectual and sophisticated artist with a singular visual language. Tillers juxtaposes layers of complex art historical, political, literary, personal, and philosophical references to create thought-provoking works that explore themes relevant to contemporary culture, identity, displacement, assimilation, and distance. panel work on Francesco Guardi’s Venetian scene, Bucentaur Departing for the Lido (c. 1775-80). However, what appears to be the sky is an appropriated section of Papunya Tula artist, Kenny Williams Tjampitjinpa’s, Kuniya Dreaming at Karriwarra (2004) which denotes a Western Desert landscape in Central Australia. Simultaneously, the interrelation of the colours and stylised zigzag patterning here evokes a de Chirico-esque rendering of water or a Post-Impressionist sky. As Tillers asserts, Fiction of Place “depicts the collision (or maybe the reconciliation) of the two worlds: the Aboriginal and the European.” This is a concept explored throughout much of his oeuvre. and Julian Daspher, acknowledging that distant, provincial cultures depend on imports from dominant cultures for much of their artistic inspiration and imagery. This layering of text and art references has become a powerful visual language for Tillers in his exploration of distance and issues of locality and identity, and constitutes a key feature of his practice, the ever unfolding Book of Power. 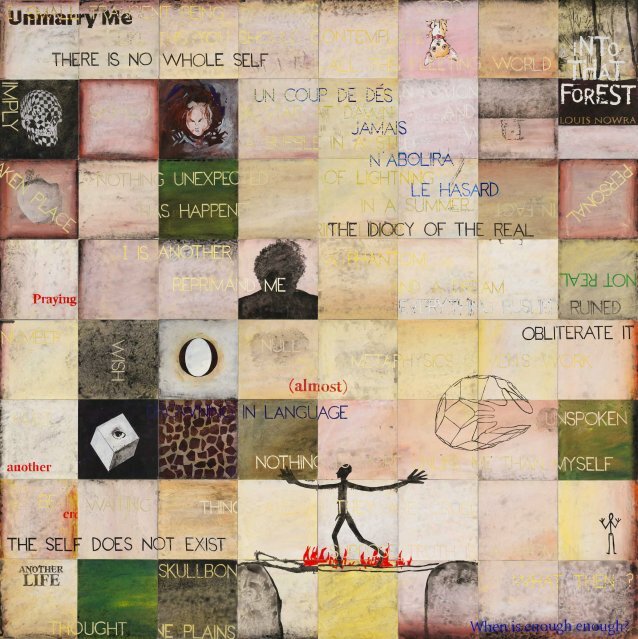 Imants Tillers has exhibited widely since the late 1960s, and has represented Australia at important international exhibitions, such as the Sao Paulo Bienal in 1975, Documenta 7 in 1982, and the 42nd Venice Biennale in 1986. Major solo surveys of Tillers’ work include Journey to Nowhere, Latvian Museum of Art, Riga (2018); Imants Tillers: works 1978–1988 at the Institute of Contemporary Arts, London (1988); Imants Tillers: 19301, at the National Art Gallery, Wellington (1989); Diaspora, National Art Museum, Riga, Latvia (1993); Diaspora in Context at the Pori Art Museum, Pori (1995); Towards In nity: Works by Imants Tillers, Museum of Contemporary Art (MARCO) in Monterrey, Mexico (1999); and in 2006 a major retrospective of his work, Imants Tillers: one world many visions, was held at the National Gallery of Australia, Canberra. Tillers was the winner of the Art Gallery of New South Wales’ Wynne Prize for landscape painting for two consecutive years (2012-2013). He has received numerous awards and commissions, such as the Osaka Triennale Prize (Gold in 1993, Bronze in 1996, and Silver in 2001), and the inaugural Beijing International Art Biennale Prize for Excellence (2003). Terry Smith’s lecture on contemporary painters focusing on IMANTS TILLERS is now online. The lecture at the Latvian National Museum of Art is part of Journey to Nowhere, a major solo exhibition of TILLERS works. 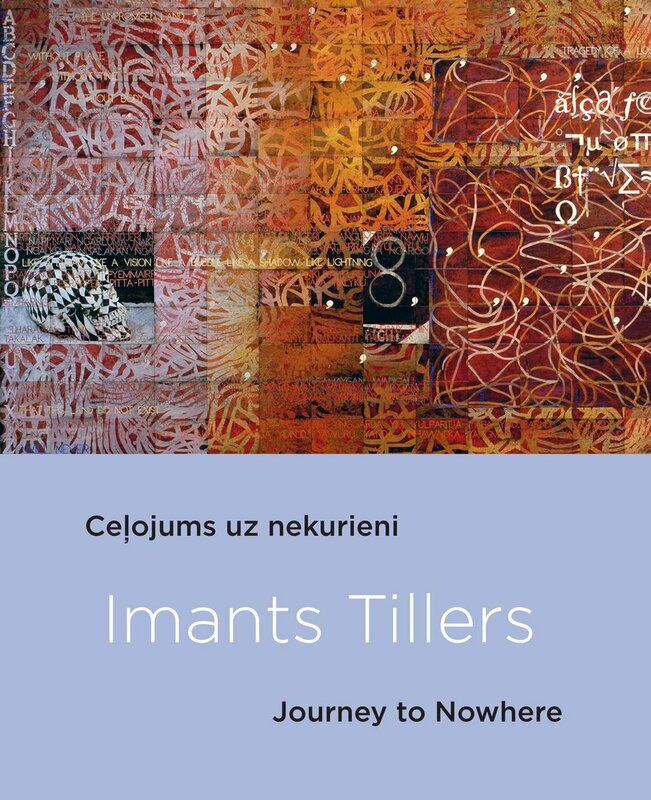 IMANTS TILLERS' major solo exhibition Journey to Nowhere is opening tonight at the Latvian National Museum of Art. The exhibition will continue until 30 September. A review of the exhibition can be read here. Imants Tillers, Installation, Journey to Nowhere, 2018. Imants Tillers, Tomb, 1987, oil stick, gouache, synthetic polymer paint on 48 canvas boards, nos. 17665–17712, 229 x 203 cm. 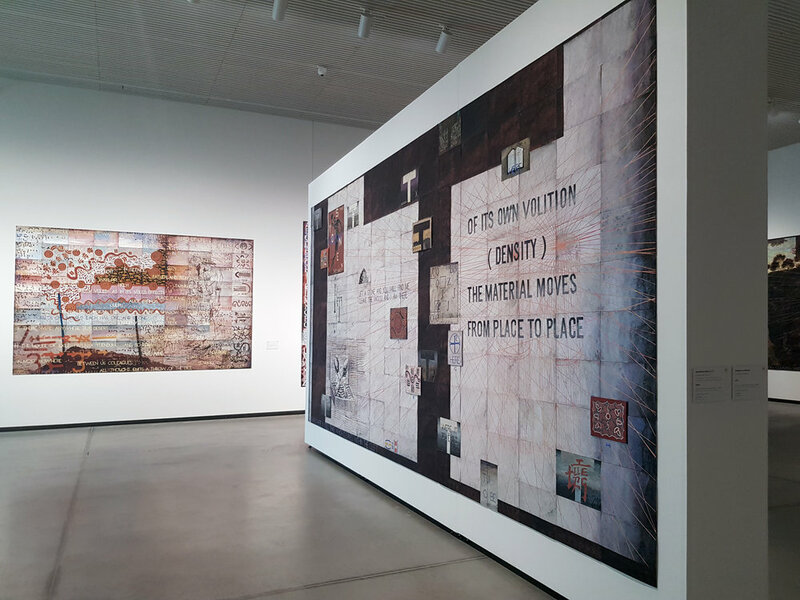 A solo exhibition of IMANTS TILLERS' is currently on display at The University Gallery, Newcastle, NSW. Curated by Olivia Sophia, the exhibition From the Studio presents 10 paintings drawn from Tillers' personal collection, spanning four decades of his practice. The exhibition continues until 26 May, 2018. Imants Tillers. The Journey To Nowhere, 2017. Acrylic, gouache on 90 canvas boards, 228.5 × 355cm. IMANTS TILLERS has been interviewed by Art Territory, in the lead up to the artist's retrospective Ceļojums uz nekurieni / Journey to Nowhere. The exhibition opens in July this year, at the Latvian National Museum of Art, Latvia. "My exhibition, indeed one could say my work, is all about “belonging” and “not belonging” – about relationships between a “fatherland” and its diaspora. In many ways, this is almost the universal leitmotif of the 20th century. Much of the contemporary world, at least what is called “the new world”, is populated by the descendants of refugees and immigrants, most notably Australia..."
Imants Tillers, Warped Coast - Nature Speaks:FY, 2017, acrylic, gouache on 16 canvas boards, 101 x 142cm. IMANTS TILLERS has work included in a group show at the Waiheke Community Art Gallery, New Zealand. Grid, curated by Katherine Kennedy, is an exhibition exploring works using the grid device. The exhibition runs from 19 January — 18 February 2018. Read a recent article about the exhibition here. Imants Tillers and Michael Nelson Jagamara unveiling The Messenger at Parliament House, Canberra. Photographs: DPS/Auspic. IMANTS TILLERS and Michael Nelson Jagamara's newest collaborative painting, The Messenger, has been unveiled at Parliament House, Canberra, by the Speaker of the House of Representatives, Tony Smith. This significant painting is the third and latest major work to be acquired for the Parliament House Collection in recent years. An exhibition of works by the two artists was officially opened at the same time - Meeting Place - Michael Nelson Jagamara & Imants Tillers at Parliament House includes collaborative and individual works from the 1980s to present. On view until 12 November 2017. IMANTS TILLERS has been interviewed for an article in Art Guide about the upcoming exhibition Fred Williams in the You Yangs at the Geelong Gallery. In the article, TILLERS discusses the influence of Williams in his work and Australian landscape painting. IMANTS TILLERS will be opening next week the exhibition Meeting Place - Michael Nelson Jagamara & Imants Tillers at the Parliament House in Canberra. The show will include collaborative and individual works from the 1980's until present. The collaboration between TILLERS and Jagamara began in 2001, sending canvas boards backwards and forwards between their studios in Papunya NT and Cooma NSW to create significant large scale works. The exhibition will be open from 17 August - 12 November. An article about the exhibition opening by Helen Musa in Canberra CityNews can be read here. IMANTS TILLERS has published an article, Metafisica Australe, in the latest issue of Art + Australia. To read the article visit the publication's website here. IMANTS TILLERS is currently showing in Landmarks at Tamworth Regional Gallery, featuring works from the John Kaldor Family collection at the Art Gallery of New South Wales. Curated by Anthony Bond OAM, Landmarks is a significant exhibition comprising works from some of the world’s most influential artists including Christo and Jeanne-Claude, Andy Goldsworthy, Richard Long, Simryn Gill, Imants Tillers, and Andreas Gursky, as they explore and observe their relationship with the environment. The exhibition runs until 12 August 2017. It is presented by Blue Mountains City Art Gallery & Art Gallery of New South Wales. Congratulations to IMANTS TILLERS and GUAN WEI, whose works have been selected for the inaugural Hadley’s Art Prize at Hadley’s Orient Hotel in Hobart. Image: Michael Nelson Jagamara and Imants Tillers, The Messenger, 2014, synthetic polymer paint, gouache on 64 canvas baords, 244 x 244 cm. ‘The Messenger’ by IMANTS TILLERS and Michael Nelson Jagamara, recently purchased by The Parliament House Art Collection, forms the basis of a new exhibition opening 17 August 2017 at the Australian Parliament House. Pat Brassington, Topography in Pink, 2005, pigment print, 86 x 64cm. IMANTS TILLERS and PAT BRASSINGTON have work in the group exhibition, Today Tomorrow Yesterday, at the Museum of Contemporary Art in Sydney. Drawn entirely from the Museum’s Collection, the exhibition considers the impact of the past and the influence of history on artistic practice today. The exhibition, curated by MCA Senior curator Natasha Bullock, continues until 31 December 2017. 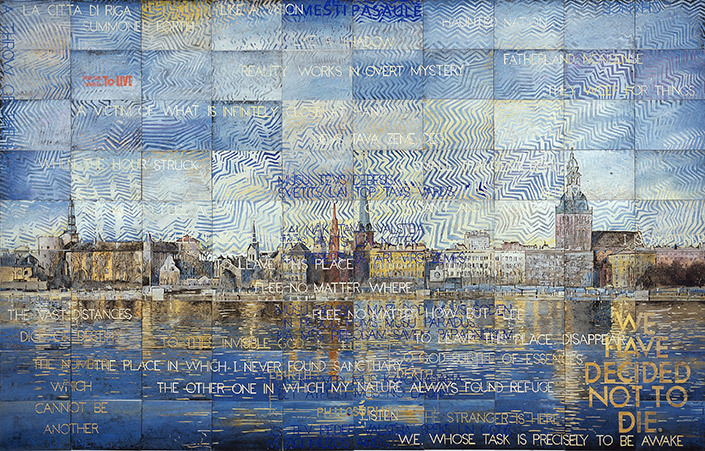 Imants Tillers, Once upon a time, 2009, synthetic polymer paint, gouache on 90 canvas boards, 229 x 356 cm. An impressive IMANTS TILLERS work is currently on view in the Art Gallery of NSW entrance court. Signs and symbols to live by is a curated exhibition in which the artists respond to the question of whether art could still offer signs and symbols to live by in the 20th Century.